The US will likely surpass Saudi Arabia as the world’s largest producer of petroleum liquids this year. As this fact – very inconvenient for OPEC and other major producers – ricochets around the world and wreaks havoc on prices and profits and debt and government budgets and perhaps entire countries, and as it worms its way into the booming US oil industry, American producers have started to do something else: export crude oil. The United States exported 401,000 barrels per day (bbl/d) of crude oil in July 2014 (the latest data available from the U.S. Census Bureau), the highest level of exports in 57 years and the second highest monthly export volume since 1920, when EIA’s published data starts. The limited exports that took place in past years went mostly to Canada (due to infrastructure constraints in Canada). Now “modest amounts” of Canadian crude are re-exported from the US. 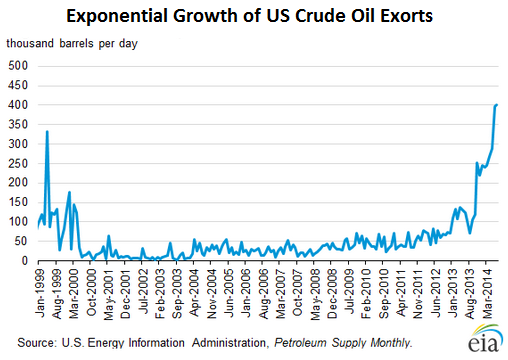 And the rest of the exports is US crude. To export crude oil from the United States, a company must obtain a license from the Bureau of Industry and Security (BIS) of the U.S. Department of Commerce…. [T]he following kinds of transactions will generally be approved: exports from Alaska’s Cook Inlet; exports to Canada for consumption or use therein; exports in connection with the refining or exchange of strategic petroleum reserve oil; exports that are consistent with international energy supply agreements; exports of foreign-origin crude; exports of California Heavy crude up to an average of 25,000 bbl/d; and temporary exports or exchanges. Licenses for other exports of U.S.-origin crude are considered on a case-by-case basis. For such other exports, the regulations describe the characteristics of transactions that will generally be approved as in the national interest. Separate legislation passed in 1996 permits the export of Alaska North Slope (ANS) crude oil. And these exponentially growing crude oil exports, in part motivated by prices that are now lower in the US than in some other parts of the world, are another element in the chaos that is currently tearing up the oil market.